CUT/Film as Found Object is a fascinating installation consisting of 14 video works by some of today's most influential artists. CUT explores how contemporary artists use excerpts from pre-existing films and television to create new narratives, different emotional content and new musical scores. Artists featured include Christian Marclay, Pierre Huyghe and Douglas Gordon. The exhibition is organized by the Milwaukee Art Museum with the assistance of the Museum of Contemporary Art (MOCA), North Miami. 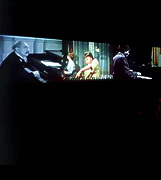 In this intriguing exhibition, artists manipulate the most familiar of media, the moving picture, film and television, restructuring reality to make the familiar unfamiliar and providing the viewer the opportunity to comprehend a new reality. The emphasis is not on the use of found footage itself, but on its manipulation to create a new work. The 14 works in the exhibition, each housed in an independent theatre or viewing room, explore a wide range of variations and methodologies. Indebted to the appropriation strategies of the '80s and sampling in hip hop and rap music of the '90s, these artists are united by their gestural use of the editing. The artists in CUT have taken the material of their reality, the movie and the news program, and manipulated it to reveal its power to communicate and shape reality. Whether through looping, repetition, erasure or compression, their active manipulation of their medium recalls the importance that action was given by Richard Serra in 1968, when he published Verb List, a list of actions that a sculptor could use to create sculpture - to roll, to crease, to fold, to cut, etc. CUT explores the actions through which artists create video. The exhibition started its tour at North Miami MOCA (November 13, 2004-January 30, 2005). After MAM, the exhibition travels to The Philbrook Museum of Art in Tulsa, OK, January 22, 2006–March 26, 2006. The exhibition is curated by Stefano Basilico, former MAM adjunct curator of contemporary art. The exhibition is presented by Friends of Art, with additional support from the Wisconsin Arts Board with funds from the State of Wisconsin. This exhibition kicks-off the second year of MAM/MIFF (Milwaukee International Film Festival) collaboration. Omer Fast, CNN Concatenated, 2002. DVD. 18 minutes. Edition of 5. Douglas Gordon, 24 Hour Psycho, 1993. Video projection. 24 hours. Jennifer and Kevin McCoy, Learning from Las Vegas, 2003. Mixed media sculpture with electronics (flatscreen monitor, DVD player, 120 DVDs). 40 x 29 x 5 inches, edition of 3 +AP (1/3).